Alexey Mordashov, CEO of OAO Severstal, was on the verge of closing a line at its Dearborn, Mich., plant in 2009 when it applied for an advanced-vehicle development loan from the U.S. Department of Energy. COLUMBUS, Miss. (Bloomberg) -- OAO Severstal, Russia's second- largest steelmaker, met all criteria for getting a U.S. advanced-vehicle development loan criticized by some members of Congress, CEO Alexey Mordashov said. Severstal was on the verge of closing a line at its suburban Detroit plant in 2009 when it applied for the Energy Department loan, Mordashov said in an interview Wednesday at Severstal's plant in Columbus, Miss. The Cherepovets, Russia-based company was the only steelmaker to apply, Mordashov said. "We saw this opportunity, and we believed we fit very well," said Mordashov, who's ranked by Forbes as Russia's second-richest person with a fortune of $18.5 billion. "We just applied for it and U.S. Steel didn't. That's the easiest and most powerful explanation." Some U.S. lawmakers who increased scrutiny of Energy Department loan programs after the bankruptcy of solar-panel maker Solyndra LLC in September have questioned why a Russian steel company that doesn't make vehicles or components was approved for a loan from the department's Advanced Technology Vehicles Manufacturing program. Severstal in July received conditional approval for a $730 million loan over 18 years from the $25 billion fund, a different Energy Department program than the one that gave Solyndra $535 million in loan guarantees. Republican U.S. Sens. Dan Coats of Indiana and Pat Toomey of Pennsylvania on Nov. 7 asked the Energy Department's inspector general to investigate the Severstal loan. U.S. Rep. Darrell Issa, R-Calif., and chairman of the Committee on Oversight and Government Reform, asked the department Oct. 27 for "answers about the decision-making processes," saying Severstal didn't need immediate assistance and that its products aren't in short supply in the U.S. The loan helped preserve steelmaking jobs at the Michigan plant, enabling it to supply U.S. automakers as they produce more fuel-efficient vehicles, Mordashov said. High-strength steel is a lightweight formulation of the metal used in automotive frames. Advanced high-strength steels are treated to give them greater tensile strength. "To make cars more efficient, it's necessary to address all parts of the car," Mordashov said. "We are addressing this with structures made out of steel." Mordashov spoke after announcing a $550 million expansion of the Mississippi plant, doubling the capacity of a facility that supplies steel to automakers like BMW and Mercedes. 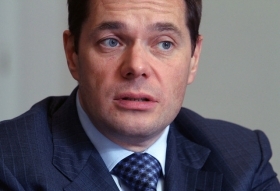 Regulators scrutinized Severstal's application for more than two years, vetting it thoroughly, Mordashov said. Severstal's financial strength was a prerequisite for the loan, ensuring U.S. taxpayers won't be on the hook for missed payments, he said. Under the program, "companies like Nissan and Severstal can set up an American company and apply for a loan to support a project here in the United States," Damien LaVera, an Energy Department spokesman, said. "This is about creating the innovative clean-tech jobs of tomorrow here in the United States." Ford Motor Co. is the biggest recipient of loans under the advanced-vehicle program, borrowing $5.91 billion, followed by Nissan Motor Co., which borrowed $1.45 billion. Electric-car producers Tesla Motors Inc. and Fisker Automotive Inc. have also received loans. Severstal, which already supplies steel to General Motors Co. and Ford, plans a cold-rolled steel mill and galvanizing line near Ford's headquarters in Dearborn, Mich. It acquired the plant in 2004 as part of its $285.5 billion takeover of bankrupt steel supplier Rouge Industries Inc. Under one incentive program created in a 2005 energy bill, companies such as Ormat Technologies, a unit of Yavne, Israel- based Ormat Industries Ltd., are eligible for Energy Department loan guarantees if their projects are located in the U.S., according to the legislation. U.S. units of Seville, Spain-based Abengoa SA have also received loans under the program. The program from which Severstal received its conditional commitment was created in a 2007 energy bill. Mordashov, 46, said in an interview last month that he plans to boost Severstal's production capacity in the U.S. to 5.2 million metric tons a year, narrowing the gap with competitors U.S. Steel Corp., ArcelorMittal, Nucor Corp. and Steel Dynamics Inc.